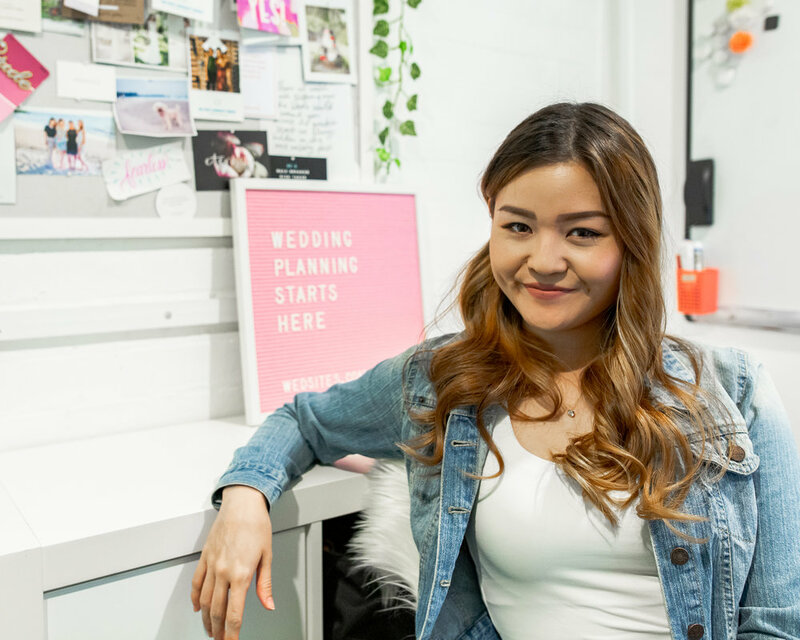 Meet Ayla, founder of Wedsites, a wedding management platform, and recent bride! Ayla and Brian are husband and wife and a dynamo tech duo. Since moving to Australia from Japan, over 8 years ago they taught themselves how to code, threw themselves into the startup world and built their first online business Themeboy providing wordpress themes for sporting websites with over 1 million users globally! Last year Ayla and Brian launched another business Wedsites, a digital wedding planning platform and have since helped over 500 couples plan their wedding. Ayla and Brian are integral members in the One Roof community. Since working out of One Roof her businesses have grown, her confidence has soared, she has made new friends, built a supportive network, and many new opportunities have arisen. Read more about the incredible Ayla below! A short summary of what you are currently working on and why? : I'm building a project management platform designed to guide couples through their planning journey and give them a fun place for them to collaborate with their fiance, bridal party attendees, and/or wedding planner to plan an epic celebration! My initial inspiration for Wedsites came about when I was Maid of Honour for my BFF who was planning a destination wedding in Hawaii. In an attempt to get organised, she started using a variety of online tools; a budgeting tool, wedding website builder, chats, digital stationery, email threads, checklists, and multiple spreadsheets for different purposes. I noticed she was jumping between and trying to manage all these different tools which quickly got out of hand and made her feel even more overwhelmed. Given my experience using different software tools, and my love for systems and automation, I just thought there had to be a more efficient way to plan this wedding. I scoured the web to find a good solution for her, but just couldn’t find anything that ticked all the boxes. Fast forward months of research, design, and development. My curiosity led me to create an all-in-one wedding planning platform and website builder to help couples streamline their communication with guests and stay organised throughout this exciting, but notoriously stressful, process. You were recently married (congratulations! ), how did you find testing your business through your own experience? : Thank you! My fiance, now husband, and I were the ultimate beta testers. We built out features that we needed during our planning process and enlisted the help from our guests and bridal party to make sure things were working as expected. I have to admit building a wedding planning startup and planning our own nuptials was really challenging at times. I could never really ever switch off because they were so intertwined! But riding that wedding planning rollercoaster, talking to our beta users and industry experts gave me so much wisdom into how I want to build Wedsites. Having gone through the entire wedding planning journey ourselves, I have a deep appreciation for all the work wedding planners do and have learned new insights into how to further improve the platform for future brides, grooms-to-be, and event planners. Is there anything exciting you are working on over the next 2-3 weeks or any big wins that you’ve had? : Since beta launching in July 2018, we’ve helped over 500 couples with their wedding planning! This year, we’re focused on getting more feedback from our couples and making iterations, introducing new design collections created by talented indie designers, and eventually rolling out another side to the platform to help wedding pros work more efficiently with their couples. Biggest tip for someone starting a business: My biggest tip for someone starting a business is to be patient. I know it can be disheartening to look at the competition or those who are way ahead of you, but everyone has to start somewhere. Building a business doesn’t happen overnight, you have to be in it for the long haul so it’s important to take it a day at a time and never stop learning. What do you find beneficial when it comes to working from a co-working space such as One Roof? : Amongst all the perks of working from a co-working space like One Roof, the biggest benefit for has been having a support network of individuals who are on a similar journey. Running a business can be lonely at times. Even though we aren’t working in the same business, just being around other entrepreneurs and knowing that I could just walk over and get a quick opinion is comforting. We're all in this together! Tell us about YOU, what do you like doing when you unplug from work? : When I’m not in front of the computer, you’ll find me catching up with friends, eating good food, or learning new things. Being in the digital world, I love getting my hands dirty and creating something tangible from time to time. I also love any excuse to jump on a plane or head to the beach to go surfing. Being in the ocean makes you so present, and there’s nothing more invigorating than catching a wave. How can people get involved with what you're up to? : We’d love for you to help us spread the word! If you or your friends are getting married, you can sign up for a free account and set up a wedding website on wedsites.com. If you're a creative in the wedding space, I'd love to get to know you and share your work with our couples! We’re also on Instagram, Facebook, Twitter, and Pinterest sharing our favourite wedding inspo from some incredible vendors, and publish weekly doses of wedding planning advice over on our blog. What have you found most rewarding about working for yourself and changing careers? : I’ve always wanted to be a wedding planner, but my career took me in various directions and places. Now I feel like the skills and lessons I’ve learned have come around full circle into something that I’m extremely passionate about. I love being able to help couples all around the world plan one of the most exciting days of their lives. I get so excited when a bride or grooms tells me how we’ve helped them. I live for that stuff, it’s so rewarding to hear from our couples. How do you find the right subcontractor? To be completely honest the best contractors that I’ve worked with have been customers who have used our products. We have people writing us almost on the daily asking us to hire them, but when someone has clearly done their research and can outline how exactly they can help, they really stand out from the crowd. It’s easy to see their value, their passion for your project and why you’d want to work with them. Why did you choose online subcontractors vs in-house team? When I started my first business, ThemeBoy, I had just moved to Australia and money was tight. I didn't have a job lined up or anything, my partner and I hopped on a plane to get out of Japan when the country was literally going through a nuclear meltdown. It was nuts. Getting an office, let alone hiring employees wasn’t an option I even considered. As any bootstrapper knows, my partner and I did everything ourselves until we got the business up and running. Over time, we grew the business to over a million users around the world, with the majority of our customers coming from the United States and Europe. It just made sense for us to have a team on that side of the world to be able to support our users around the clock. Our team is spread across the United States, Japan, Germany, Brazil, Phillipines, Cyprus, and Morocco. Having a remote team is quite common in our industry (digital commerce), so you can find some really great talent to work with. Life motto: If you don’t like something, change it. If you can’t change it, change the way you think about it. Find Wedsites on Facebook here, follow them on Instagram here or Pinterest here, or check out their website here.